Winter = Whiskey, Novels, and Naps. I went to the coffeeshop because I wanted to write deliberately. Both my blog and my art have been neglected this season, as winter is only good for whiskey, novels, and naps. This morning, however, I determined ten hours of sleep was enough and got up at 8:00. Don't hate me for sleeping so long ... I was having a lovely dream that my neighbor was raising a tiny baby elephant that took naps in a sugarbowl. Who would want to wake up from playing with a kitten-sized elephant? But it's time. My 1099s are postmarked, and though I'm still deeply immersed in the thrilling mystery, QuickBooks for Dummies, I know it is time to pull myself out of this funk. My red boots are on, and I've already answered 15 emails, been to two banks and the post office, all before 9:15. Now I sit at the coffeeshop, forcing myself to write. Some people say you must wait for inspiration to strike. I say you must practice so you're not sweating profusely when said inspiration finally appears. Things I've learned during my deliberate writing? So far, I've learned that my natural inclination is for two spaces after a period, which apparently makes me old-fashioned. Also, I've learned that even half-caff gives me the jitters. And that forcing oneself to write does not necessarily lead to brilliant posts, but it does lead to massive "To Do" Lists. Said lists can be inspiring, however, especially when they involve some of winter's favorite things: whiskey, novels, and naps. I plan on checking each of those things off today. It's very important to feel like you're getting something accomplished. Also, thanks to the huge number of you who have proven that audiences can and will show up BEFORE the show starts if they actually believe that the music will start on time. I played my first notes at 8:01, and I played them to a full room. It was a good night. See bands around the world? Just assure your crowd that your advertised start time isn't a lie, and no one will think you're crying wolf. Now, if anyone out there stole FWT's laptop, please either kindly return it. Meanies. Ticket giveaway and deep thinkin'. Today's blog is just a thank you to everyone out there who reads my rants and raves and comes to my live shows. I'll be giving away a pair of tickets to the Headliner's show with Nellie McKay, and I'll announce the winner by 5:00pm Eastern. It's a short window because, well, it's January, and I apparently have no ability to get out of bed. And if you don't win, you can still buy tickets to the show. Winter always brings me into a tortuous self-reflective phase. I say "phase" because I know the daffodils will cure it in March. This has been a particularly rough winter, one that has included unfair illnesses and deaths, general malaise, and necessary escapism. It's been a winter that makes me wonder what I'm doing with my life, and how I can possibly think that my career choice is the slightest bit important. I mean, the great Richard Holbrooke's recent and untimely obituary talked about how his life consisted greatly of ending wars. Talk about a contribution to humanity. And what do I do? Sing a little? Then I remembered a woman at Tim Krekel's funeral celebration who approached me. She said, "I just wanted to tell you that I heard a song of yours on the radio this afternoon, and it made me smile for the first time in a long while." I'm not saying I'm going to change your life. Every day I struggle with what insanity (or maybe it's vanity) makes me get on stage and sing. It seems completely ridiculous in the face of massive unemployment, environmental disasters, and war. But I try not to sing about that. I don't think it's ignoring the bad stuff. It's focusing on the good stuff, and really, I think my goal is to make someone out there smile a little. Enough philosophizing. Anyone who would like to win tickets to the Nellie McKay w/ Brigid Kaelin show at Headliner's in Louisville (Tues Jan 25), just comment (or if you're reading on the auto-facebook import rather than brigidkaelin.com, you can just "like" it) on this blog by 3:00pm (ET) today. And if you'd like to comment, but don't want to be entered in the ticket drawing for whatever reason, just let me know somehow. Thanks! The 18 and over show at Headliners is at 8:00 p.m. (doors at 7:00) Tuesday, January 25. Tickets are $12 at the door and at ear-X-Tacy. The Importance of a Passport. But mine's gone! During spring break of my sophomore year at NYU, my roommate Lyzz and I were seemingly stuck in NYC. Everyone else was going home, but flights to our respective homes (Houston and Louisville) were hovering at $500, which was just absurd. We reluctantly decided we would have to just stay on campus, which is really just a week of vacation in Greenwich Village and not exactly your typical quad. That would have been a well and dandy vacation, had I not been obsessed with the Last Minute Travel section of the Village Voice. There it was: $150 (including taxes) per person round trip to London, England. I think we were each convinced it was a scam until we boarded that plane at JFK, but we did indeed have a week's worth of adventures in London and Edinburgh for far less than it would have cost us to go home. Amen for hostels! That's also when I learned the near and present importance of having a valid passport with you at all times. Had Lyzzie and I not been thus prepared, we would not have discovered the Baked Potato Shop in Edinburgh nor have had the opportunity to watch the West Point Rugby team drink the entire airplane dry. To this day I remain obsessed with travel websites and airfares. For example, if you'd like to go to Cancun tomorrow, it's only $500 including flight, taxes, and hotel. But I can't go with you. Because I sent my passport off for renewal this morning. I am stuck. No last-minute trips to Amsterdam with FWT. No cashing in those frequent flier points for a weekend in the Bahamas. Stuck! Really, it seems silly that in 2011, you STILL have to mail in your current passport in order to renew it. They all have barcodes by now, so can't they just make the barcode inactive or something once they mail you your new one? Hmpf. Anyway, I paid the extra $60 for expedited service because I am already freaking out at the knowledge of being passportless for at least two weeks. I hope I don't need to flee. Private jets, secret countries, and taxes. Anyway, I kind of love all the perks that come from having an AmEx card and using it. I don't have one. I've almost gotten one several times, but I just don't imagine I'd ever spend enough money to be offered the super-fancy cards with private jet service. Last Saturday night, while paying my 4th Quarter Federal Estimate Taxes online (what did YOU do last Saturday night? jealous? ), I came across something that made me think I should get one of those cards immediately. First of all, I thought I was a genius when I discovered I could pay my taxes online. Being self-employed means I pretty much pay double taxes, so I was very excited to find that I could put my taxes on a credit card. I suppose that could be a dangerous option if one were, say, given to running off to Paris rather than paying off one's credit card, but I would never do such a fiscally irresponsible thing... hee hee. Really, though, I decided that if I'm going to be spending thousands of dollars on boring things like FICA, then I should at least be getting Frequent Flier Points for them. So I just pay them on my Mileage Credit Card, and I at least feel like I'm getting a treat for being honest. After I paid the taxes, I saw an option in the corner of the screen that was just hard to believe. It wasn't a too-good-to-be-true phenomenon, but rather a seriously-that-can't-possibly-be-fair kind of thing. But I clicked on the option, and surely, it was fo' real. It had a little AmEx logo on it that said: Use Membership Rewards ® points towards your payment and convenience fee when making a FEDERAL TAX PAYMENT through Pay1040.com. You can click on that last sentence and see if for real. And it is. So I gather that, like many credit cards, AmEx gives a "point" per dollar spent on the card. You can use those points for all kinds of things, like most mileage cards. But ... in addition to getting airline tickets for spending LOTS of money on your card (that's sensible enough), now AmEx Members can actually use their points to pay for their federal taxes??!?!? How is that possibly fair??!?! People able to spend tons of money don't have to actually pay taxes? Amex does it for them?? I mean with years and years of collecting mileage points, I've ALMOST enough for a FlipCam. Hmpf! I wonder how many points it would take to pay my 1st Quarter Estimates for 2011. And would the points I'd get on a trip to Paris cover them? Then my quarterly dilemma would be resolved. I'm playing a show next week. Can you believe it? I know most of you think I'm just a blogger who writes about food and silly ideas and random travels, but really, by profession -- at least according to my taxes -- I am a musician. Shocking, I know. Those of you in the Louisville vicinity, please consider coming to Headliner's on Tuesday, January 25. I'm playing at 8:00, and I'm opening for Nellie McKay. I admit that when I first heard Nellie McKay on the radio, I was envious. Our first albums came out at about the same time, and we had really similar sounds. Except she was getting all kinds of radio play, and I was still playing only in my hometown. I'm over that envy now, and I've had my own adventures. And though our influences are still obviously similar (can't help that we both studied jazz piano), I'm really excited to be opening for her. It's going to be a really fun evening, filled with irreverent, quirky female songwriters. Don't come out if you're wallowing in a January melancholy, looking for sad or tortured music. Come out and be entertained. Sure it's on a Tuesday, but the show starts early (8:00), and I'll be playing some new tunes. Oh, and don't forget to pay those estimate taxes. They were due last Friday (oops). Oooooh ... and happy birthday, Peter Searcy! I read recently that 750 million people world-wide watched that wedding coverage, and that was in 1981. That's about 17% of the entire world's population. Compare that with 75 million who watched the final Seinfeld episode (weak), or better yet, the 700 million who watched THIS year's World Cup Final -- about 10% of the world population. Now think how many more people own TVs than did in 1981. I'm sorry, but the amount of people who viewed Charles & Di's wedding is just mind-boggling. I mean, come on, it's just a wedding. But everyone seems to remember where they were that day. I also remember figuring out one day while I was in college -- shortly after Princess Diana died, which happened while I was eating a taco from San Loco with Lyzz -- that I would never get to be the Princess of Wales because I don't have a drop of Protestant blood in me. Such a silly thing could never stop true love, I'm sure, but I wouldn't have wanted William to abdicate for me. (I mean, wouldn't that defeat the purpose of trying to become a princess?) But it was a sobering moment, and I felt sorry for the Prince, knowing that -- were we to ever actually meet -- he would know immediately that, legally/royally, it could never be, no matter how completely and utterly in love with me he would have fallen. I have now decided to become completely obsessed with the Royal Wedding, and I hold no hard feelings for Miss Kate Middleton. In fact, I have decided to think she is great. My resolution to remained royally-obsessed is difficult for me because I don't buy magazines, and I have a short attention span. Also, celebrity gossip isn't really my thing because I don't watch enough television to know who is who. I'm going to try to stick with it, however, to gather details, watch coverage, and hope that Kate's train is half as long as Diana's was. Though I don't relish the idea of yet another social media site to keep up with, I do love the idea of GoodReads. I also love that it roused a competitive streak in my family when we discovered the "stats" feature, a button that creates a bar graph of how many books/pages a given member read in a given year. For example, during dinner last week, I mentioned that my dad was definitely going to win the reading challenge because he's reads quickly and often. Mom piped up by suggesting that she'd be the sleeper winner because she reads all the time even though Dad gets all the credit. The race is on. Only a day after I listed my GoodReads Book Challenge as fifty books for 2011, my dad logged on and listed his goal as fifty-one. I hope he knows this isn't The Price is Right. I'm currently on target, having read two-almost-three (both rather short, but one a classic). I have a proclivity for novels, especially novels set in far away lands or times -- not so much fantasy or sci-fi, but things like Wuthering Heights or historical fiction. This year I should probably try to branch out and read more non-fiction, but I can't help it. I love storytelling. Do you have any reading goals? Is that a silly thing to get competitive about? Really, for me, I think it just makes me aware of how easy it is go to a month without having read anything. And then months ... and then, well, I just don't feel human anymore. Anyway, I'm going to set a short-term goal. If I've read 6 books by February 14, I get a pizza party. Who's in? My new health care scam. I went to the doctor a few months ago, and now I keep getting bills. I pay them because I'm the type of person who pays her bills. I pay the one from the doctor, the one from the hospital, the one from the lab, etc. Don't you think that it's probably a really genius scam? Maybe I should just start sending random $18.00 bills to people from a mysterious lab. If anyone thinks it's worth the $18.00 to call and ask what the bill is for, then I will just say, "Oops, mistake, sorry. Don't pay it." But I bet the majority of people will just mail a check. Watch out if you get a bill from BAK Labs, everyone. Babysitting Recap, Stranger Danger, and Pixie Sticks. I survived the weekend of being a Governess. We aren't going to be in a music festival anytime soon, but we did manage to record a little "Happy Birthday" and text the video to the kiddos mom. I bet Julie Andrews wishes she could have texted those kids singing "The Hills are alive..." to the Captain. It would have saved at least an hour of the movie. Actually, the weekend was pretty fun and easy, but that was mostly due to the kids being good, as well as me not being their actual mother. It's easy when you just say things like, "Sure, you can wear whatever you want," or, "Yeah, okay, go ahead and buy that giant Pixie Stick with your SkeeBall winnings. Sure, you can eat it before dinner. Just save room because we're making a quick ice cream stop before your parents get home." FWT got pretty tough with the 8-year-old, though, with his most threatening phrase being the almighty, "Two more bites!" The worst part was the madness of Incredible Dave's, which was like Chuck E. Cheese on steroids. It was filled with expensive games, and lots of kids who clearly crapped their pants but were having too much fun to waste time with a bathroom stop. I can see how it would be fun for a kid, but all I could think about was making sure I never lost sight of the eight-year-old. I blame my over-protectiveness on growing up in the 1980s (Stranger Danger™), as well as the apparent fact that growing up I looked exactly like Ann Gotlib, a freckled redhead who was abducted from a Louisville mall and appeared on every milk carton in the country. People used to stop my mom all the time, pointing out the similarity between her child and the girl who had been missing for ten years, but all that did was make me obsessed with being kidnapped. So, yeah, I could pass on the arcarde next time. But Taco Night, Movie Night, and Hang-Out-in-Your-Pajamas-All-Day Night, was all pretty great. I'm just glad we went home before the sugar high kicked in. I'm doing something this weekend I haven't done in ten years: babysitting. All weekend long. You see, we've got some friends who pretty much have everything in the world they could possibly want (for example, a seven-bedroom cabin in Gatlinburg). This makes getting them birthday/Christmas presents for them pretty much impossible. So FWT -- while sharing a few drams too many with them -- volunteered the only thing we have to offer: watching their kids for a weekend while they take a trip together. Fortunately, I like their kids. I deal with them all the time from teaching piano lessons here and there, and I was a live-in nanny back in my NYC days. So I'm pretty much a professional kid-watcher. In fact, I prefer to be known as a governess. That's another thing: these kids are going to have to call me Fraulein Brigid. I shall call them Liesl, Fredrik, and Märta. I know for a fact that their mother just got new drapes for the formal living room, so I shall be making play-clothes out of the old drapes for our montage scene. Also, there will be nightly singalongs, especially in case of a storm. I will not permit frogs or pine cones. FWT, who doesn't quite get it, says he is bringing a whistle so he can teach them to respond to commands. "Yelling for them from across the mansion just won't do," he says. "These kids need discipline." I think he just has trouble pronouncing the umlauts in their [new] names. Winter camping for the spoiled rotten. You may recall that I went camping for the first time ever last April. FWT took me, and I tried to smile the whole time so as not to appear too prissy. Truly, I don't require much. I spend a great deal of time in tour vans and on people's couches, so it's not like I need a jacuzzi tub. I just don't like to be cold. (I also don't believe boys when they tell me that you can stay warmer while 'winter camping' by taking off your clothes.) Although I slept in ALL of my clothes and was still freezing cold, so those Boy Scouts might be right about sleeping naked after all. Anyway, when some friends of ours invited us to spend New Year's Eve at their "cabin" in Gatlinburg, I figured I could handle it. Last April's foray into camping had sufficiently prepared me for sleeping in the mountains. It wasn't the camping trip that prepared me. Rather, it was those times I got bumped to Business Class on a flight. It was the times I used to nanny in NYC and was the babysitter at fancy UN dinners at the Waldorf Astoria. It was attending a gala or two. It was getting sneak peeks into a lifestyle I couldn't afford on my own, and -- sadly -- getting a bit used to it. This "cabin" was indeed built entire of logs, albeit the logs were 2-3 feet in diameter and covered three stories, thousands and thousands of square feet, seven bedrooms, six bathrooms, a game room, oodles of fireplaces, and better water pressure on top of this mountain than in my house in the city. There was an unbelievable kitchen complete with an eight-burner stove and a microwave that was smarter than I am. The hot tub (part of the wraparound porch that featured built-in speakers connected to the amazing sound system) was unfortunately out of commission because the bears apparently found it before they went into hibernation, leaving claw marks and fur everywhere. (I bet the bear that stumbled upon the hot tub got HUGE props from the clan leader.) Also, there weren't any quirks like squeaky floors or doors that don't close properly or windows that provide a crisp breeze when entirely shut. Basically, there was no need for any camping gear whatsoever. The only time we needed a Swiss Army Knife was when we were too lazy to go up two flights of floating spiral staircases to find scissors, so we could open the butter package to make movie popcorn in the game room. (Yes, it was one of those fancy old-fashioned red rolling movie popcorn machines, like you see in SkyMall.) There was a pinball machine, Golden Tee, shuffleboard, a pool table, a TV in every room, and flawless WiFi. I was almost able to actually relax and not do any work for a day or two. Almost. But I did learn that I like cabin-camping more than tent-camping. I think my standards may be abnormally high now though. I was never one of those little girls who dreamed about being in the Miss America/USA Pageants, but I did always like watching them on TV. My favorite was the talent competition, particularly the rhythm baton dancers and the bad singers. (I'm not sure that the Miss USA pageant would be big on a musical saw concert in the talent competition.) So when I was seated next to Miss Kentucky USA at the Inaugural Gala on Monday night, I admit to wanting to plow her with questions. I also admit to liking this whole red carpet/fake celebrity thing, and I always feel like I'm pulling a great heist when I get all dressed up and have my picture taken at some event. Since being a musician obviously doesn't pay well, it's the little perks like an invitation or a free CD that make up for the salary. 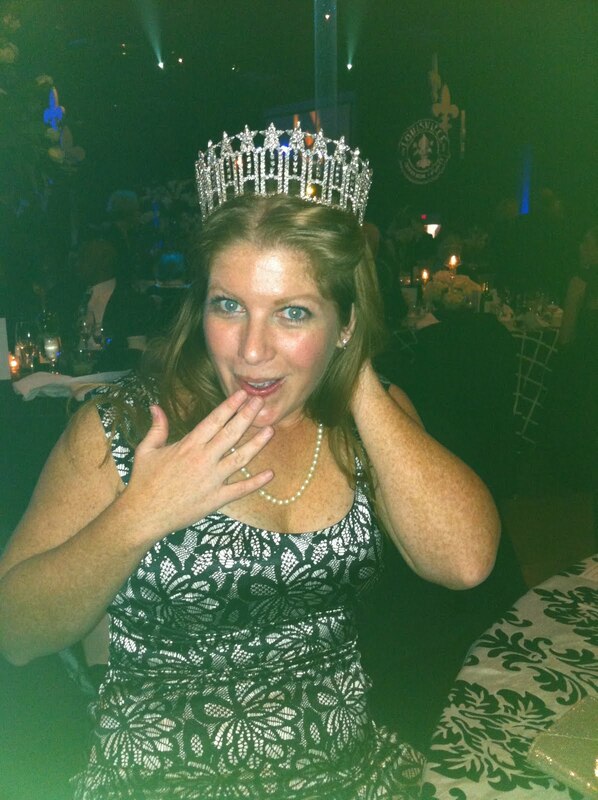 But speaking of great heists... hee hee... when Miss Kentucky USA took the stage at the Gala for the Talent Competition -- in which she blew everyone away by singing "Proud Mary" and completely owning it -- she opted to leave her tiara and sash back at our table. Honestly, folks, I had been kidding earlier in the day with my tweet: Apparently Miss Kentucky is also singing tonight. 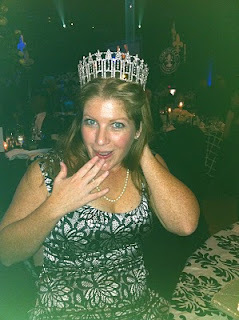 Wouldn't it be embarrassing if we showed up in the same tiara? But there it was, just sitting there, inches away from my wine glass. I felt some sort of Beefeater responsibility to guard the Crown Jewels of Kentucky for about thirty seconds. Then I felt mischievous and needed to try it on. It's heavy, folks. And so sparkly and big. If Miss Kentucky USA hadn't been so perfectly nice and charming and an amazing singer to boot, I might have taken a lap around the room in that magnificent tiara. But as it was, I just put it on long enough to take a picture and giggle wildly, then watched her wail the rest of "Proud Mary." I was a little afraid to post this on here because I'm sure she's on Facebook and might not appreciate my skullduggery. But then she seemed to have a good sense of humor. Besides, I promise to watch her and cheer for her on TV this spring. I just hope one of the other girls is a rhythm baton dancer. Happy new year to those of you on the Julian calendar. It's been a busy few weeks for me, from spending time with family in Lubbock, to visiting friends in Austin, and "camping" (in a mansion on a mountain) in Gatlinburg, to playing shows here and there. I got back to Louisville at 3am on Monday morning, having driven home after playing a fun show in Nashville with Peter Cooper and Eric Brace. Last night, I sang at the new Louisville Mayor's Inaugural Gala (which was open invitation to the public, to those of you who messaged me saying you wished you'd been invited, you sillies). It was a really fun event, and I'm starting to think that all big events should be held on Monday nights. People tend to behave themselves when they know they have to work the next day. Even I only had one cocktail, which I'm pretty sure I sweat out immediately on the dance floor. The whole event was impressive, and I've never seen the Convention Center looking so classy. Really, it was just a fun night, and I was really happy to be a part of it. I do think it a bit odd that they gathered Louisville musicians and then had us sing cover songs -- I sang "Dancing Queen," no kidding -- but then, I can appreciate wanting songs people want to dance to. Also, I'm not sure that my most popular song, "Future Mr. Used-to-Be," would have been appropriate for a show honoring New Mayor. It was a nice change though, as well as the easiest load-in in the world. I just showed up and sang. I think I could get used to that. First and foremost, I am going to record soon. It's been too long, and I've got way more material than I need. Second, I've been bad about this blog the past couple of months, and I resolve to get back on track. Thanks to all of you who have been reading. I really love your comments and messages, and I hope to have lots of adventures to write about in 2011. Third, and maybe most important, I'm going to find some way to delineate work and play. It's so hard when you're self-employed because not checking voicemail on weekends often means missed opportunities and angry clients. But I need some down time. I need to figure out a way to balance playing-around-on-Facebook and promoting-my-music-on-Facebook. This year: balance.